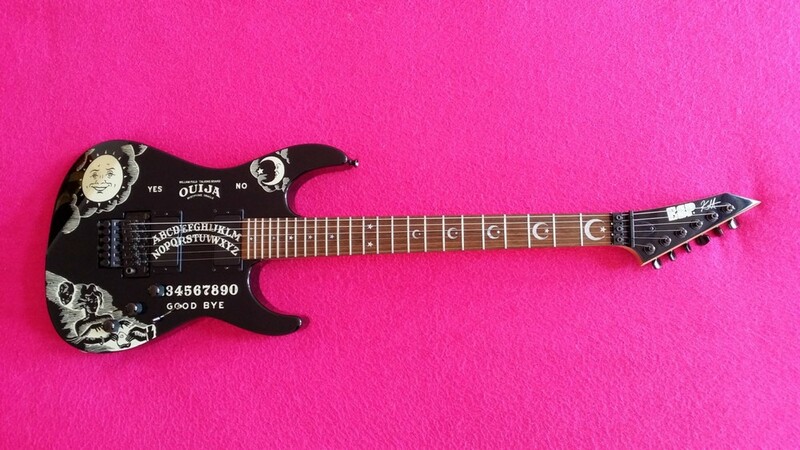 FIRST EDITION OF THE EPIC GUITAR OF KIRK HAMMETT! There is no known fact to how many of these were made because was available also as custom order. 1995 - K-21023 * - 20761? 1993 - M2 CUSTOM - 61946 - REVERSE INLAYS! 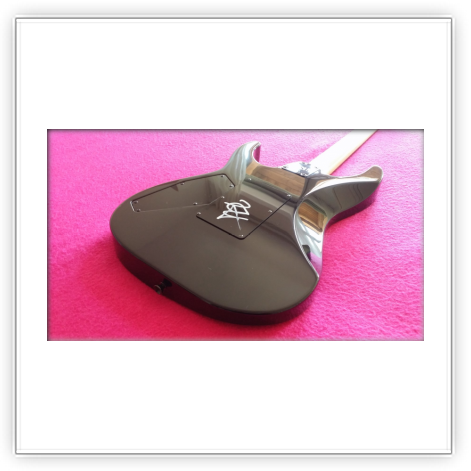 in collaboration with Rick of SteelEdgeGuitars. I´m gonna keep some of that details in secret as I don´t really wanna people to make counterfeits. The 2nd Ouija ever made was given to Kirk not long ago after first one. 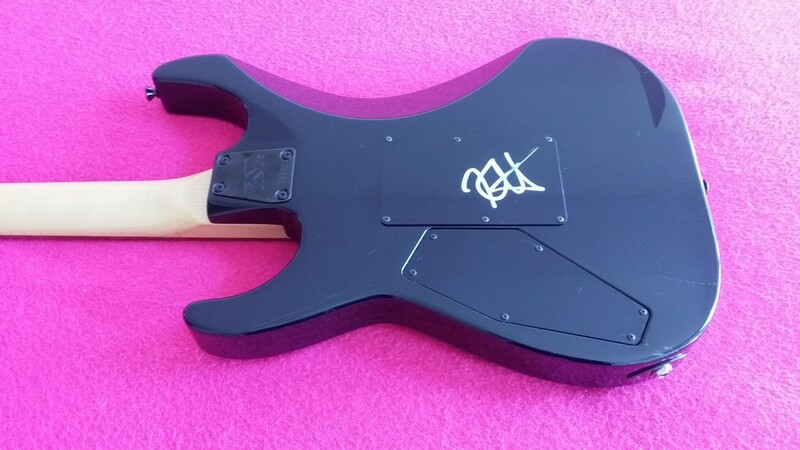 It has almost the same characteristics as the first, except for these: higher frets (probably extra jumbo frets), two EMG 81, “regular” volume knob placement, "ESP Custom Guitars" circle logo on back of the headstock. 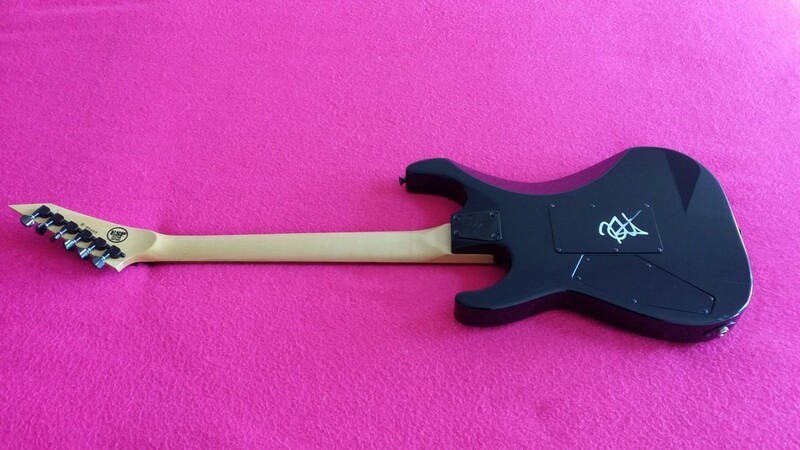 This one was also used by Kirk onstage, as well as for recordings, photoshots, etc... 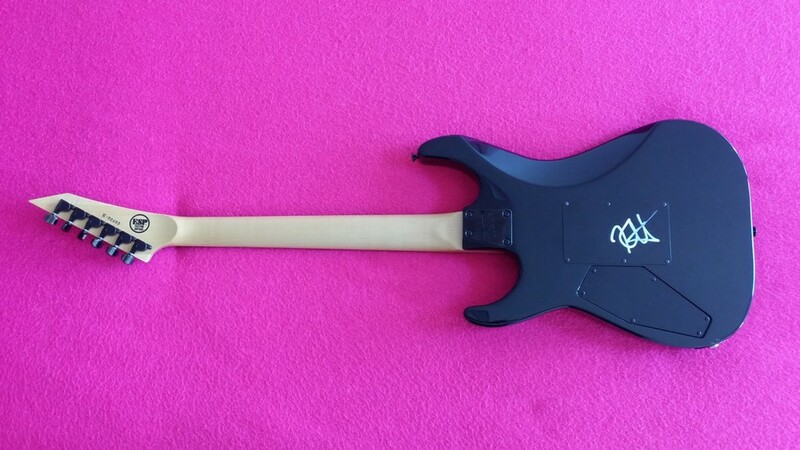 He gave it to a member crew, long time friend with him called Dan, it was dedicated to him by Kirk with some notes in the back mentioning this was one of his main tour guitars as well as used for recording in several albums. 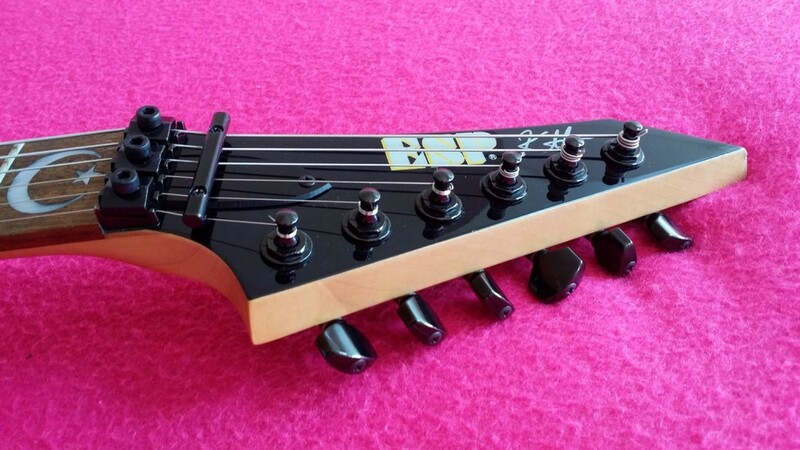 It has a full "Kirk Hammett" signature in white on the top of the headstock. (all the next ones have the KH signature). 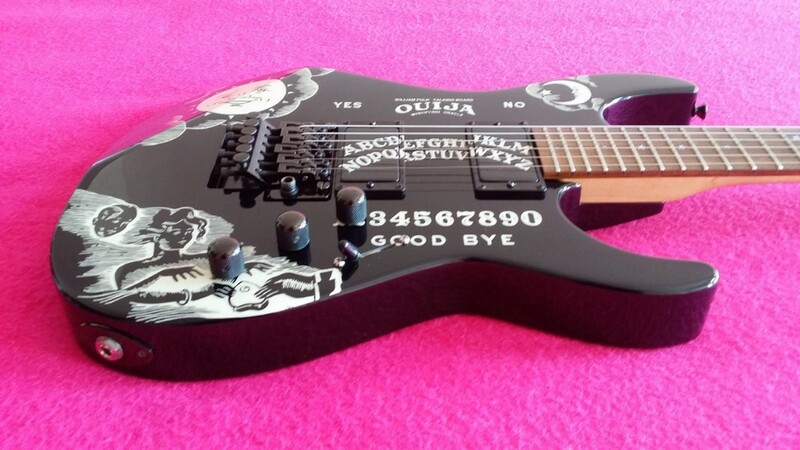 The 3rd Ouija ever made was a custom order for some “big boy” at ESP, then later was given to Armand Crump (Slayer guitar tach r.i.p. 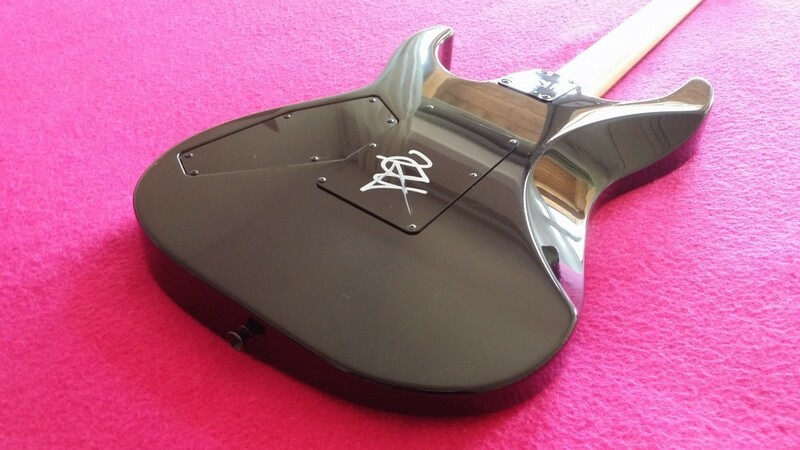 2012), then sold to a couple more owners and now is property of Rick of SteelEdgeGuitars. 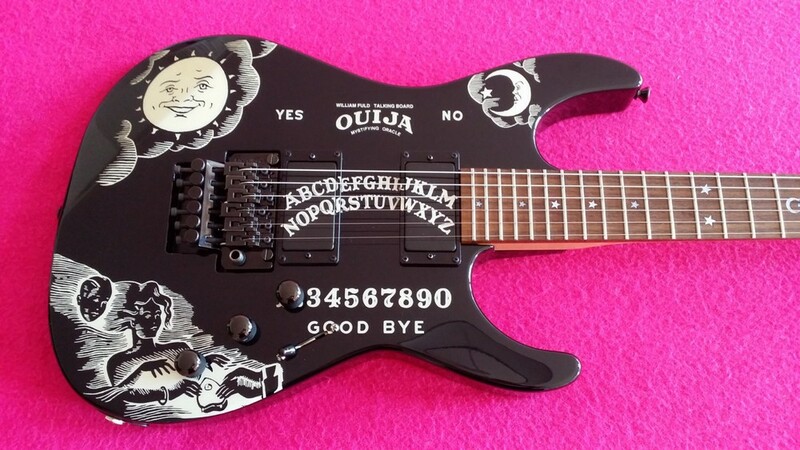 It has almost the same characteristics as the first ouija made, except for these: no spelling errors, no "KH-3 Style" logo on front of the headstock, little different black paint in the neck to body transition. Two more neck thru Ouijas are said to be made. After many research have not yet been found, so the 4th and the 5th are considered lost or missing or, maybe, never producted at all. 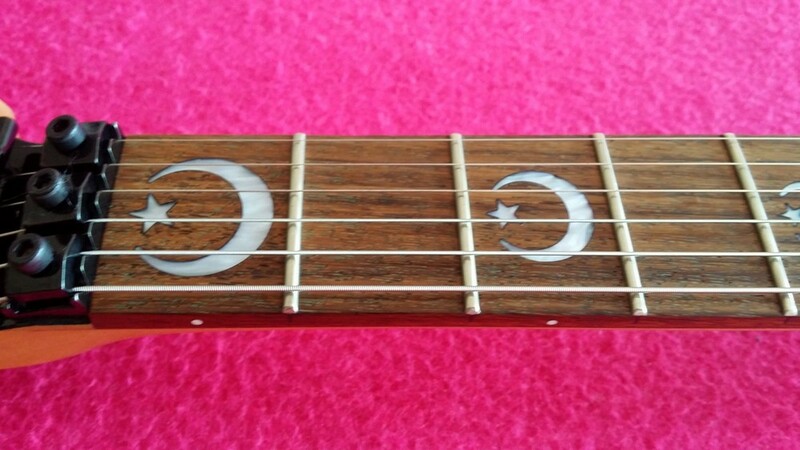 Correct islamic flag inlays. 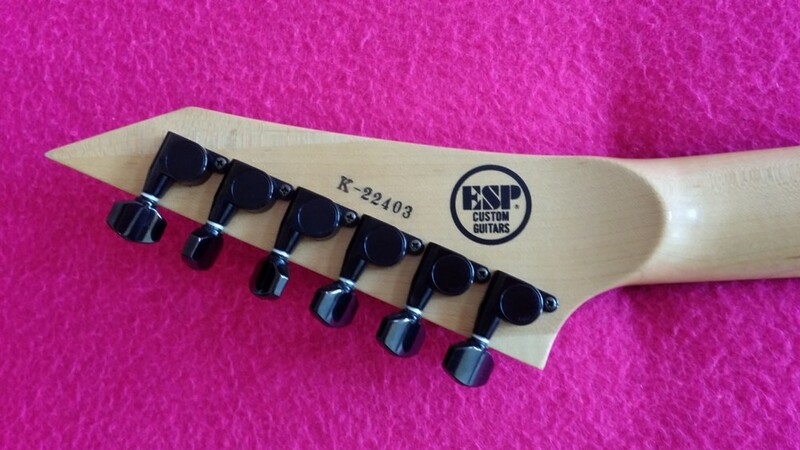 Appears officially in the 1995 ESP catalog in "Custom Order" section. All of the first production ouija's were bolt ons. Production was healted due to infringment of the Parker Brothers board game graphics in 1998. - notes: comes with ESP C.O.A. and ESP hardcase but many of them has lost his goods during years. 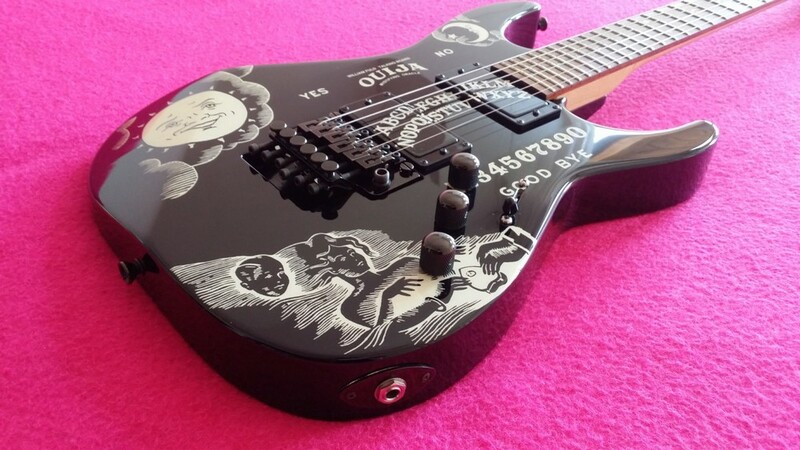 "I did have an original black ouija back in the 90's it was a custom shop order i placed in 1995 and received in 1996. It was neck thru body. I do not know the serial #. 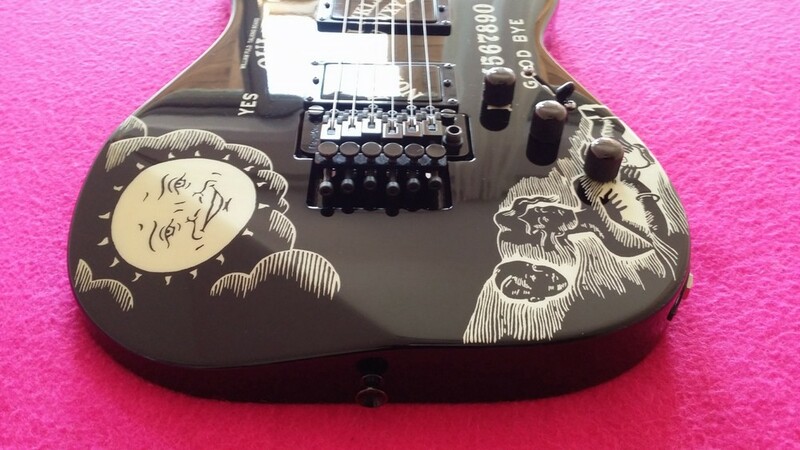 However, it had custom inlays. 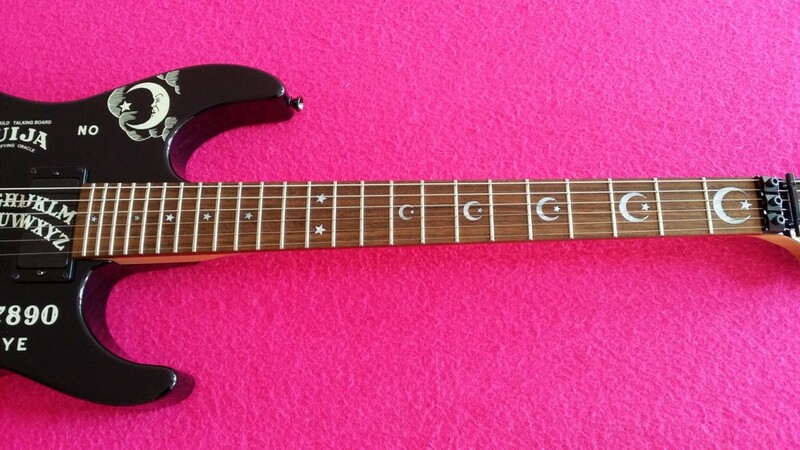 It had a crescent, but not like a crescent moon, more like a cat's eye, with a dot instead of the star and then turning to dots at the 12th fret. It had the glow in the dark paint but it never really glowed. I sold the guitar in either late 1998 or early 1999 to a player in the Chicago area (where I was living) via Harmony central. I believe I paid $1,895 for the guitar brand new as a custom shop order. Things were more affordable back then." Many of them have lost their C.O.A. (Certificate Of Authenticity) and / or OHSC (Original Hard Shell Case) during years. 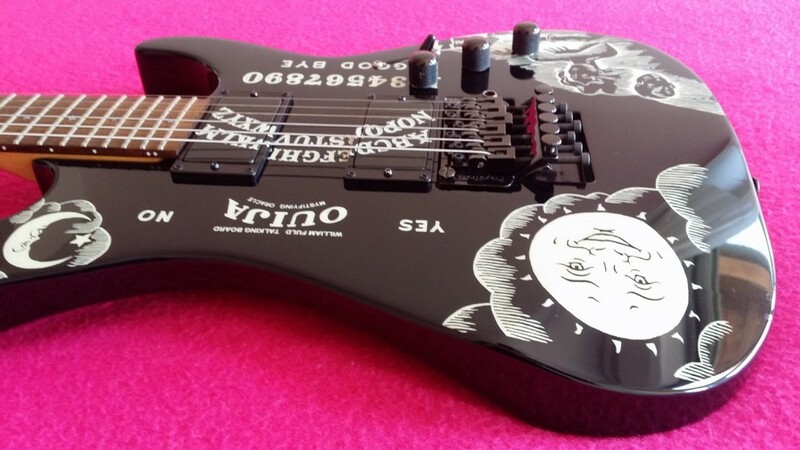 2004 - 2 Neck Through Body with moon & stars inlays: 1 for Kirk Hammett and 1 for ESP "boss"
- 6 digit serial number and ESP black circle logo on the back of the headstock. Kirk start to use this one live in 2004, the other one was on sale on ebay in 2012.